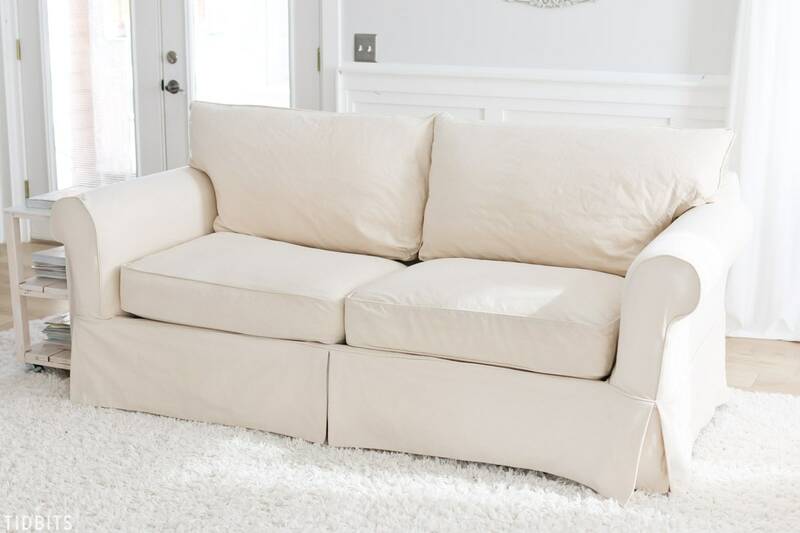 Light colored slipcovers versus stains. No problem! 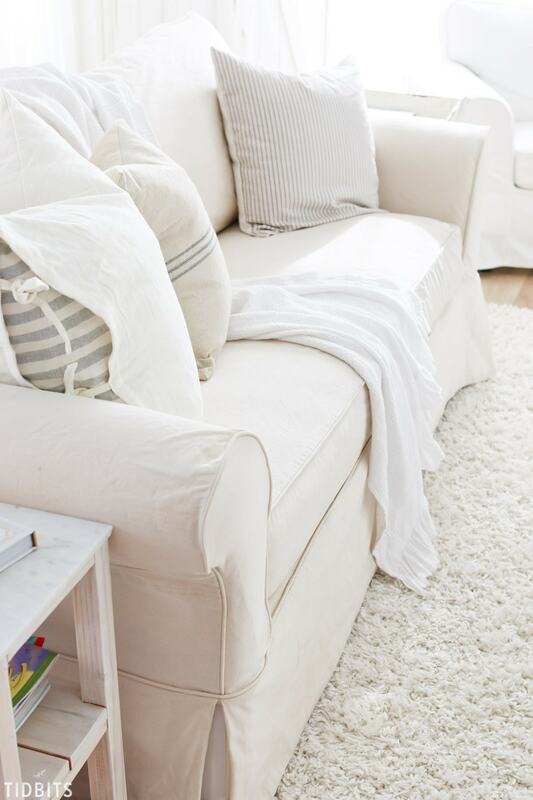 Get my tips and tricks for cleaning slipcovers and learn how I’ve kept my cream colored sofas spot free for years – with 4 kids! Including spot cleaning hacks, my laundering process, and how I avoid ironing my slipcovers at all cost! *This is a sponsored post by the maker of ARM & HAMMER™ Super Washing Soda. I received compensation for this review but all opinions are 100% my own. Affiliate links are also included in this post. Thank you! My readers have asked. My friends have asked. My family has asked. White slipcover hating folks all over the world have asked. And lest you make the claim that my answer must be “photoshop”, I’m here today to share my tried and true tips and tricks for cleaning slipcovers, naturally – no photoshop necessary. 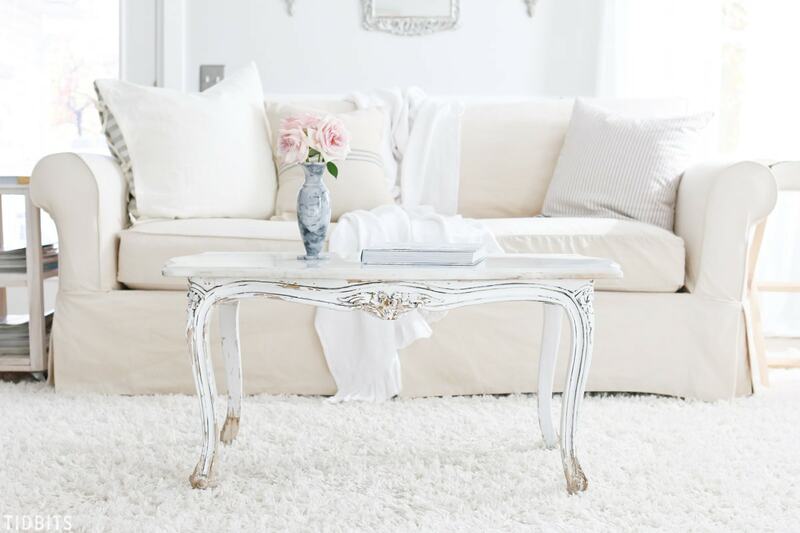 We have a creamy white slipcovered sofa, but these methods will work for any color of slipcovered sofa or chair that need cleaning. I typically wash my covers 4 times a year, just before each season and especially before Holiday entertaining. So I took advantage of a slower Fall Saturday morning to take my sad looking sofa from drab and stained . . .
. . . to fab and clean! I do love a refreshed and smellin’ good sofa! Having had this particular slipcovered sofa for near 2 years now, I have experimented with several methods of cleaning. The first time I was nervous I’d ruin it, so I spent $50 to have it dry cleaned. If you’ve been around my block a time or two you know my sensitivity to harsh chemicals, which you can read about in my story HERE. After I brought the covers home from the dry cleaner, I couldn’t sit on my sofa for days without getting a migraine. 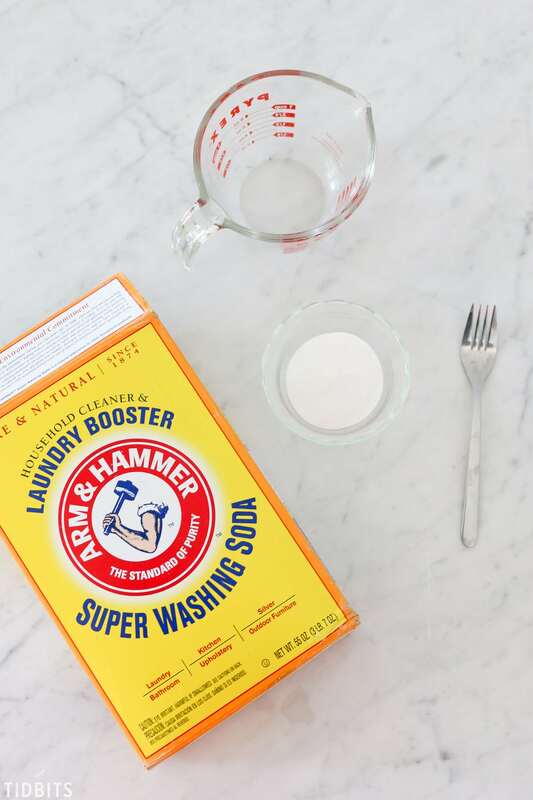 So I’ve tried other natural ways to brighten and get rid of stains, and found that ARM & HAMMER™ Super Washing Soda (not to be confused with baking soda) is the key ingredient, and it is pure and natural. 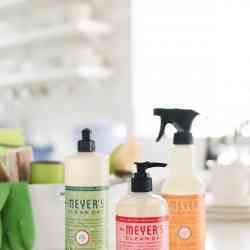 I keep this stuff on hand for all sorts of cleaning, but use it mostly with my natural laundry detergents to freshen and make better work at dirty laundry. It does such a good job with dingy whites! 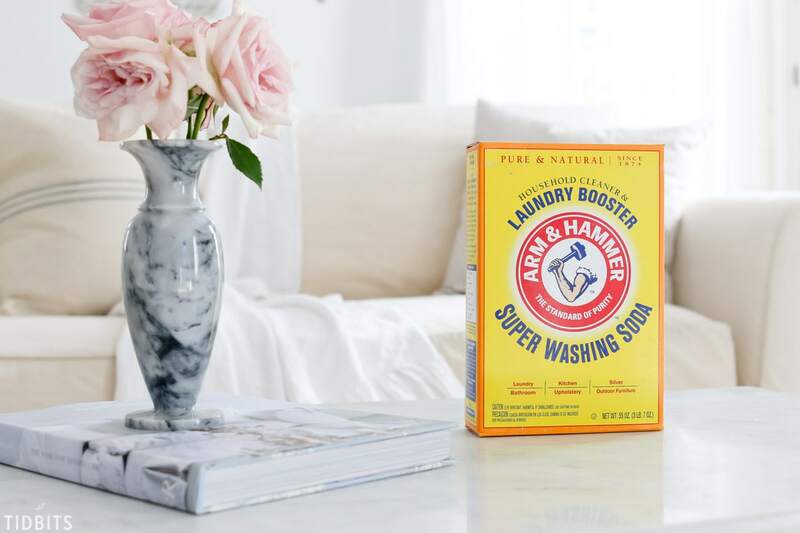 *Feel free to follow this link to save 75 cents on ARM & HAMMER™ Super Washing Soda and other great products at your local supermarkets. 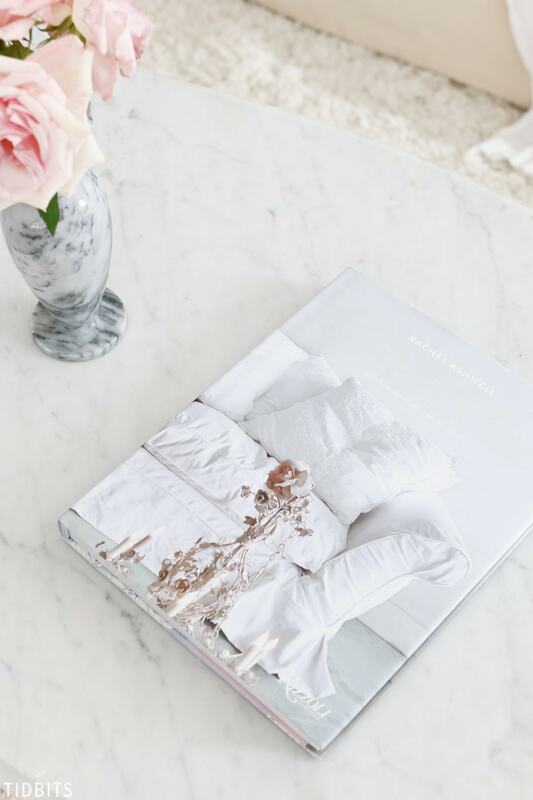 Please read on for my spot cleaning hacks, laundering process, and how I avoid ironing my slipcovers at all cost! And if you ever want to ask me if I regret getting a creamy white slipcovered couch . . . the answer will always be – not in a million years. I love her so! 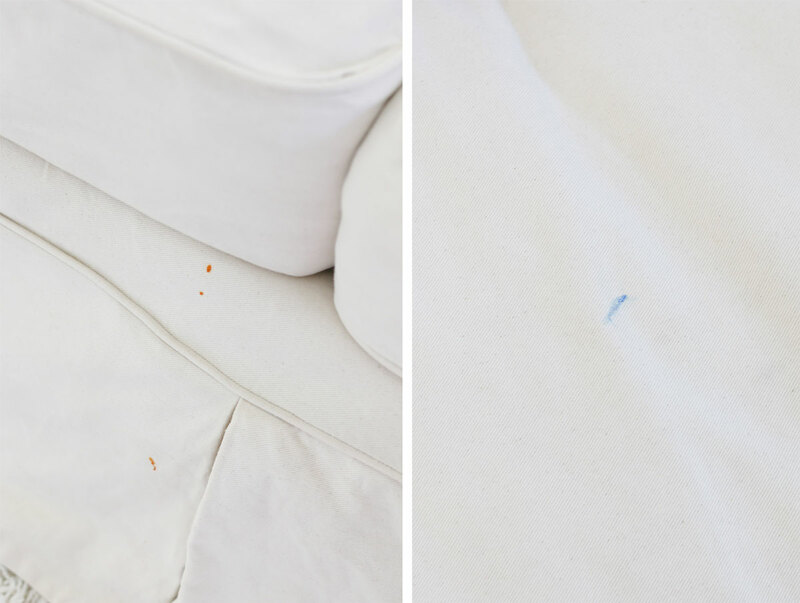 Logically, every time your kid smears Nutella on your slipcovers, or colors them with washable markers (even though you’ve told them 1000 times markers aren’t allowed on the couch), or plops down to relax with their dirty little feet . . . you are not going to strip off the covers and wash them. That would make you a crazy person . . . trust me. But you can spot clean with my little pasting trick! See below, the recent culprits. On the left, we have my sons ritual morning fruit/veggie sauce in the little squeeze pouches. (Ya, I’ve told dad not to give him those on the couch 1000 times too. Sigh.) Can you guess what is on the right??? So here is how I spot clean, when needed. 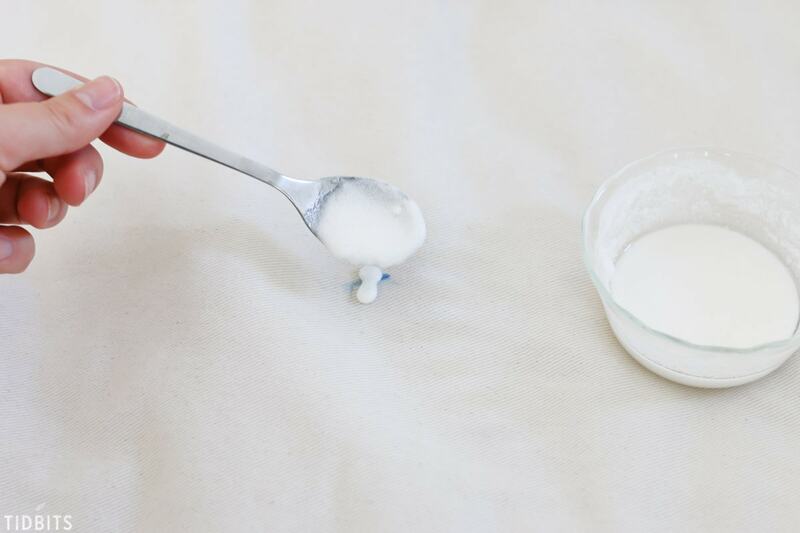 Make a paste out of Super Washing Soda, by mixing 1 part Water to 1 part ARM & HAMMER™ Super Washing Soda. Measure accurately or on a whim do a spoonful of this, and a spoonful of that. Mix it together and let it sit for a bit to become a thicker consistency. Next, spoon some of the paste right onto the stain, covering the stain completely. Let the paste sit on the stain for at minimum, 10 minutes. At this point, the paste will harden. You can scrape it off to reveal the stain, which will still be there. But the ARM & HAMMER™ Super Washing Soda will have done its work and made it 100 times easier for you to scrub it off. I prefer a good microfiber rag for this step. The earlier you catch the stains, the better. As you can see, this sauce proved to be more difficult to get off just by scrubbing. It had sat on my slipcover for over a week. The paste and scrubbing took most of it off, but I was concerned this stain had gotten the best of me. I was relieved that after my laundering process, not a trace was left. Let me show you. To prep for laundering, unzip all the slipcovers (cushions included) and remove them from the couch. Be certain they are right side out, and all zippers closed. When loading, do not fill the washing machine too full. My full size sofa is done in two batches. One for the base of the couch, and the other for the cushion covers. With your load in, add the detergent that you normally use, then add 1/2 cup of ARM & HAMMER™ Super Washing Soda to the washing machine drum. There are other directions for deeper cleaning and tougher stains found on the box. Set your cycle to normal, and I suggest warm water, but cold should also work fine. Before you move on, I’m going to yell this next statement at you, so you don’t miss it. DO NOT PUT YOUR SLIPCOVER IN THE DRYER!!!!! Do not put your slipcover in the dryer for 2 reasons. Instead, you are going to put your covers back onto the sofa and cushions while still WET. They shouldn’t be dripping wet from the spin cycle, but you definitely want them wet. 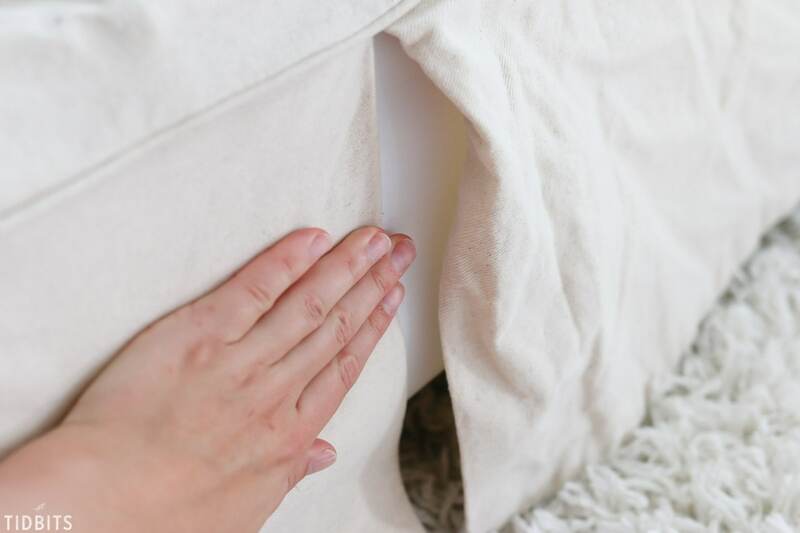 Doing it this way will allow you to fit them back on nicely, and then you can just finger press or hand press your way to a lovely slipcover. See here the difference of the one hand pressed side, versus the one I hadn’t done yet. This hand pressing works so good when wet. I’m certain it would be a nightmare to try to iron out all the many wrinkles once dried in a dryer. Take a look at the spot now, where I wasn’t sure if those small stains would lift. You probably won’t be able to work out every wrinkle, but my personal slipcover philosophy is that slipcovers were meant to look cozy. The few remaining wrinkles don’t bug me at all, but if they do, I bust out my flat iron and take care of the rest right there on the sofa. Spot clean, launder and hand press! You won’t believe how fresh your whole house will smell after this process! This should be all the justification you need to get yourself a creamy white slipcovered sofa, or more fully enjoy the one you have. 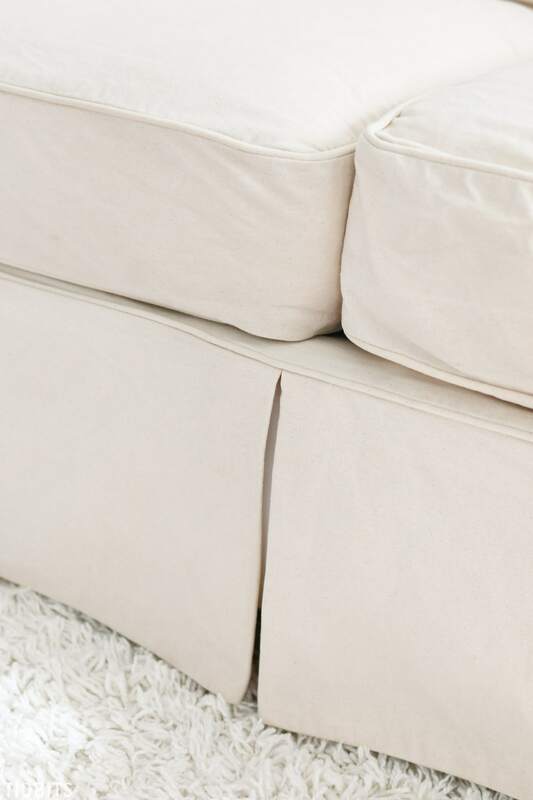 I’d love to know how you feel about slipcovered sofas, or do you have a few cleaning hacks of your own? I’m sure there is more out there! Well done and thanks! I’ve wanted white slip covers for years but have always been afraid to order them and even more scared to try making my own. Where did you get yours? Thanks for sharing. I enjoyed this! 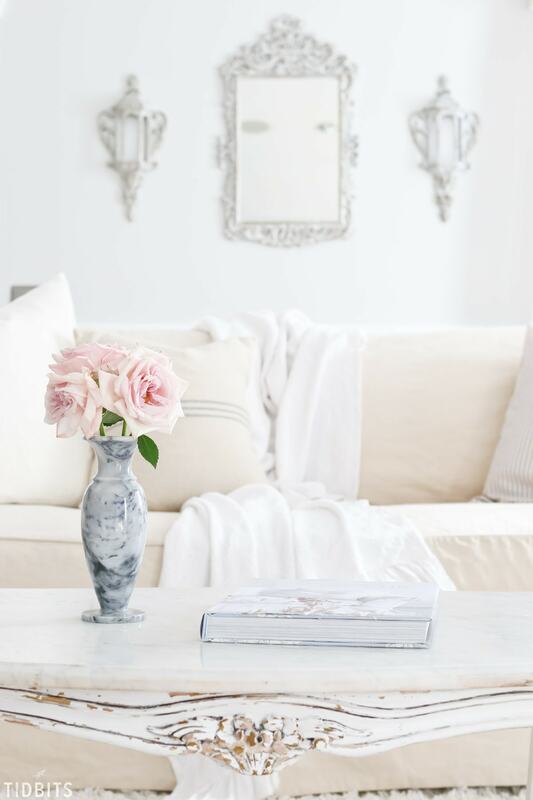 I love the look of white slipcovers but with a husband who is a mechanic, 4 kids and 2 dogs, it can be a little scary to think about! 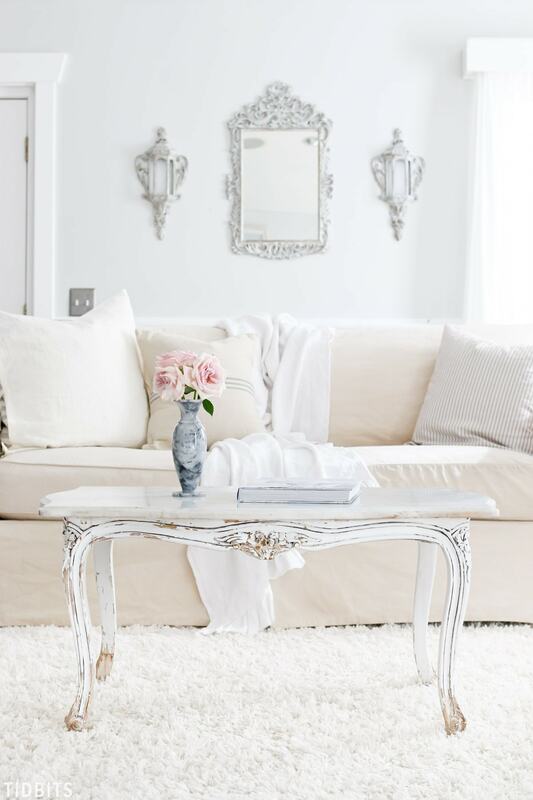 Came, I love your nearly all white room. Where did you get those beautiful decorations on each side of the mirror? Were they something you found and painted? If so, what sort of item would I be looking for? Thanks! Hi Cami! You know, I like white, coz it makes my room spacious. But white color can be easily dirty. My little son usually drives me crazy by drawing something in white pillows and cushions. It’s really a problem for me. But fortunately, I found tips that I need here. Thank you a lots! Good job! Please keep writing and sharing with us! I love this I usually hang mine to dry. Never thought of putting them on while damp. How long before it’s dry and you can sit on it this way Cami? It helps so much with those pesky wrinkles! After 24 hours it feels totally dry for me, and I allow the fam to sit on it again. 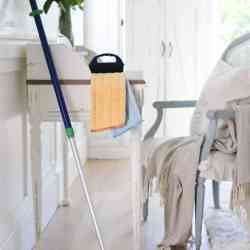 Very useful tip on cleaning stains Like Angela, I would like to know where you purchased your beautiful slip covers. Thanks. Thank you! I have a direct link right up there in my blog post. Just click the sofa image in the carousel slider. Thanks for the info. I can’t see the links to the slip covers. I see the “shop this post” and the widget link but nothing happens when i click on it. Im not seeing the carousel images. Any help would b great. Thanks! Katie, I had some broken link problems. Will you check again and see if you can see them. They should be up now. Thanks! And where did you get your sofa, please? I have a direct link to the sofa I have, right up there in my blog post. Let me know if you can’t see it. It’s on a carousel image slider. You can just click the image. I love this idea as I have the same sofa. I always put mine in the dryer and wonder if the cushions become mildew when you put the covers on wet? My covers always dry very quickly and I haven’t had that problem at all. But perhaps an extra spin cycle would make it even better. Great post! I have an IKEA Ektorp couch and change out between Khaki and red corduroy. How fun to have 2 colors! I could have a hay day with that 😉 . Glad you enjoyed the post! Thanks for the tip and tutorial! 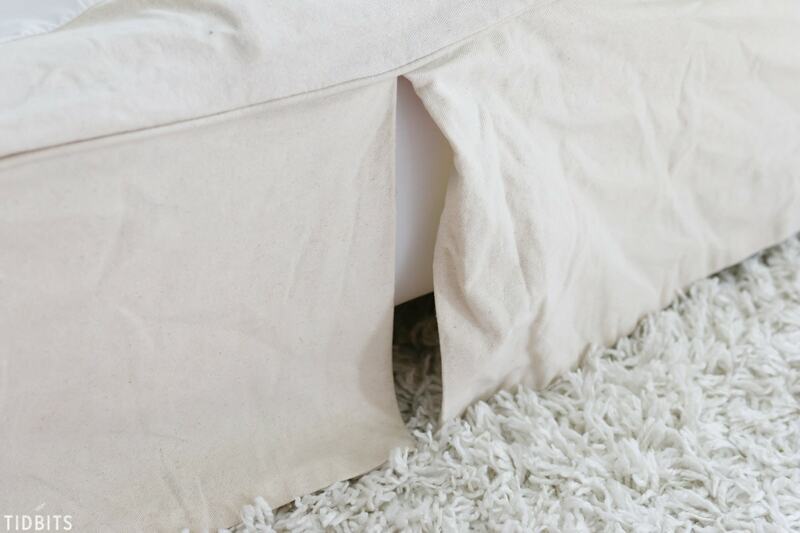 Do you know if this is also safe for gray slipcovers? Love any and all tricks on cleaning & especially laundry . Im very OCD especially with laundry . People think im nuts because I love washing drying & folding clothes , been told many times … Donna when you fold clothes it’s like your ironing them & when you put them on they unfold and look ironed . Never even knew Arm & Hammer made a washing soda or powder , once again thanks so very much !!! My white slipcover says to dry clean only and desperately needs to be cleaned. Is yours a dry clean only as well? I am scared to launder it in the machine in fear of what will happen. We have only had our white couch since April, but with three kids and a new dog, it’s time. Yes Melissa, mine says to dry clean only, which is why I did that the first couple times too. But I braved it and it worked great though I would never dare dry it for fear of shrinkage. I think it’s worth a try! Start small maybe, with just a cushion cover and see how that goes. Good luck! Can’t wait to see t to try this in my off white slipcovers. I was just about to buy new slipcovers, even though mine are only 5 years old, then saw this. I’m certainly going to try it. I washed mine and put them back on wet, but also used a steamer for the skirt wrinkles. It works great! 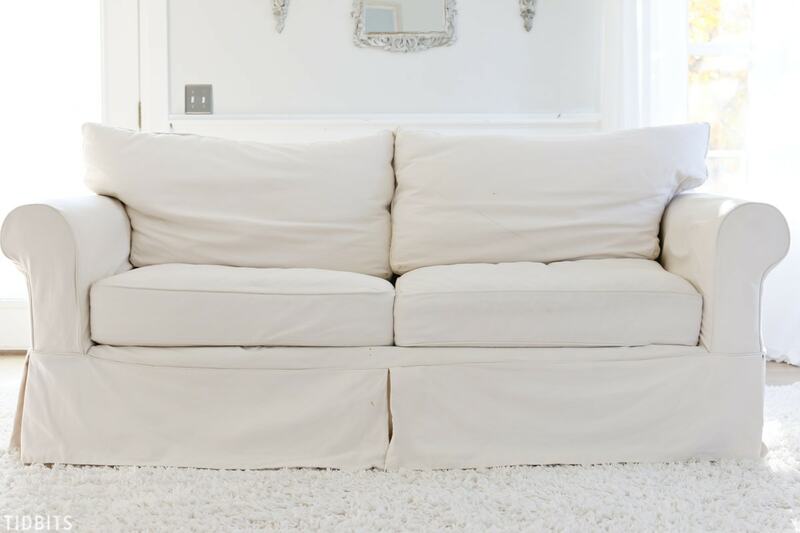 If the slipcovers are very wet and it is a slow drying day, they can cause your sofa or pillows to mildew. Treating that would be a real job. You have to be careful. I usually let the slipcovers lay across the washer or if you have a free, clean counter, for an hour or so before attempting to put them on. I usually flip them over a time or two to be sure they are all about the same dampness. Good luck! Hi, loved ur site! 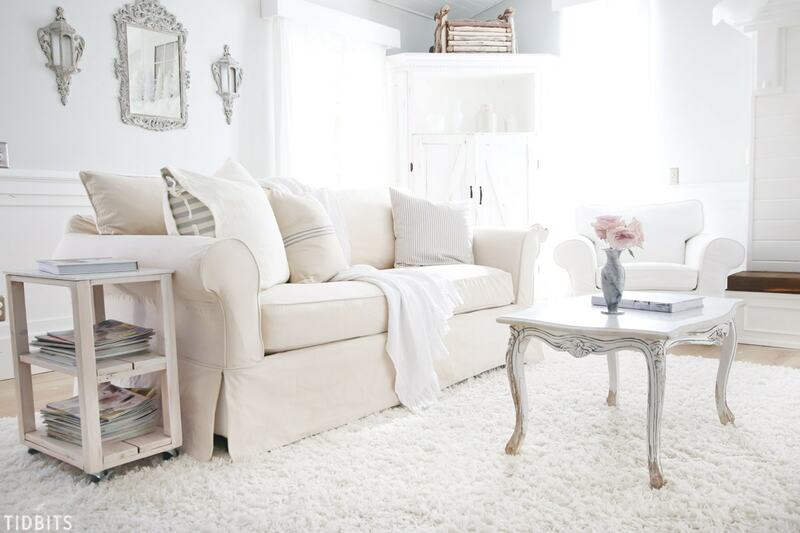 But I HAVE to ask… what do you use to keep your white rug white??? We recently installed cream/beige in 2 of our kids rooms and while they are older teenagers you’d think they could keep it clean… I’m just about ready to cry and tear it out! Lol… what system/machine do u use to clean it? After reading your article on the slip cover I’m so tempted to add some of that arm and hammer trick as well… dabbing a paste as well as adding some to a carpet cleaner. Any ideas? Please???? Thanks! 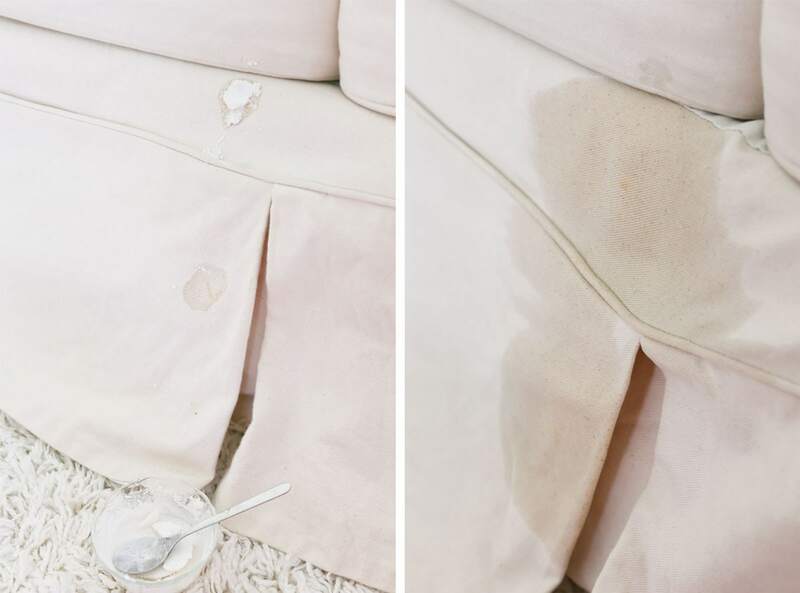 Your blog article about TIPS AND TRICKS FOR CLEANING SLIPCOVERS was excellent. Your expertise on describing the details of the topic was even better.The advice you have listed was excellent and I found it very helpful in many ways. The steps ware so amazing because you cleverly covered most of the aspects in a short note. 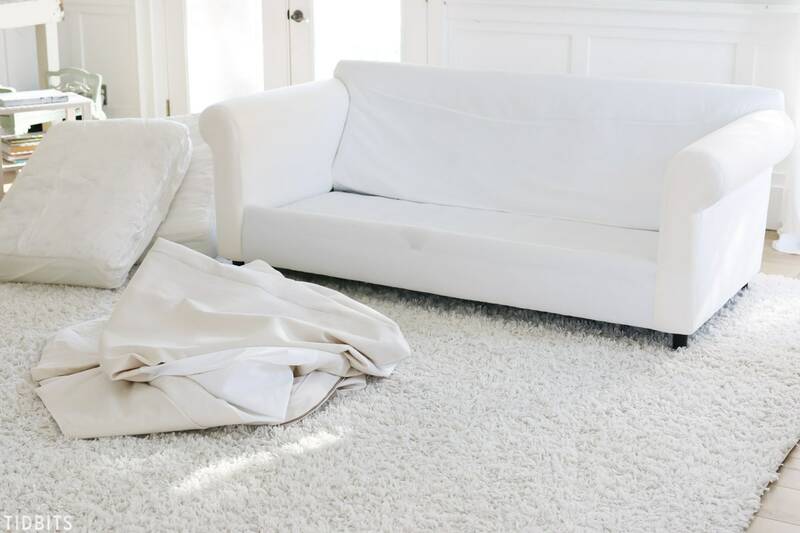 Great tips for cleaning slipcovers. Did a great job thanks for the awesome read. Great tip. Using soda paste can help you so much while cleaning. That and vinegar as well. I have the same slupcovers as you. Curious what you’ve done for more difficult stains? And if you’ve had any that just refused to budge with this method. Recently got banana on the cover and it will not come out after multiple attempts :/ my covers are also starting to shred the threading on the inside from washing despite zipping them up. Has this happened to you? Love your idea and your style. This is the perfect blog post for cleaning clothes with super washing soda. I really appreciate your hard work. Are you have any youtube channel? please keep this necessary tips day by day. It’s a great opportunity for me to read and visit your page actually I love the information of this article it helps me a lot, this article is so informative!so keep it up I suggest you can also visit us and read our vertical blinds singapore for you to help to do more article like this one. I love tips for cleaning slipcovers. Thanks for your post! 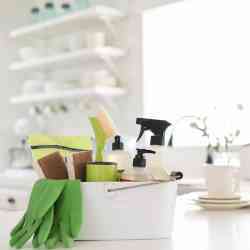 Cindy Huggins recently posted…How Can The Best Microfiber Mop Help You Clean? Great post! Thank you very much! The tips which you presented looks awesome I already tried them all. and it all worked really well for me. People should definitely try it they will surely get the best result. I wonder if power washing could clean your slipcovers.